I thought I would take a minute to wish everyone a Merry Christmas. I hope everyone takes the chance to take a break from looking up dead relatives and spend time with living relatives and friends. In my family, my mother used to make Christmas dinner, as she did for every other holiday during the year. As far as the menu, it was not set in stone, there was variety every year. About 10 years ago I took over the “chore” of making Christmas dinner. I don’t remember exactly why the switch was made, but now feeding the family on Christmas day is in my hands and I enjoy it. The first year we had filet wrapped in bacon. It was good but I don’t remember what accompanied the steak. The second year I decided to do a prime rib. It was a big hit and now my family looks forward to prime rib on Christmas. The sides change every year, with the exception of creamed spinach. I think if I stopped serving creamed spinach I would be disowned! With a new little great nephew this year, I hope that he looks back years from now remembering Christmas dinner prime rib at Aunt Barb’s house. Although this year he will be enjoying a bottle and Stage 1 baby food. In the evening my sister and I will head to my Aunt Mary’s house. Aunt Mary is my Dad’s sister and she hosts a family gathering every Christmas night. She has been doing this since the late 1970s when she took the tradition over after the death of my grandmother. Ever since I can remember the Henrys gathered on Christmas night to eat and just spend time. It is the only time during the year that I see some relatives on that side. As a small child I went because, well, you don’t really have much of a choice at that age. In my 20s and early 30s I didn’t go every year. I exercised my independence I guess. After the death of my father in 2004 I have made an effort to attend every year (as long as the weather cooperates). I now appreciate the opportunity to see these loved ones, if only for a few hours a year. 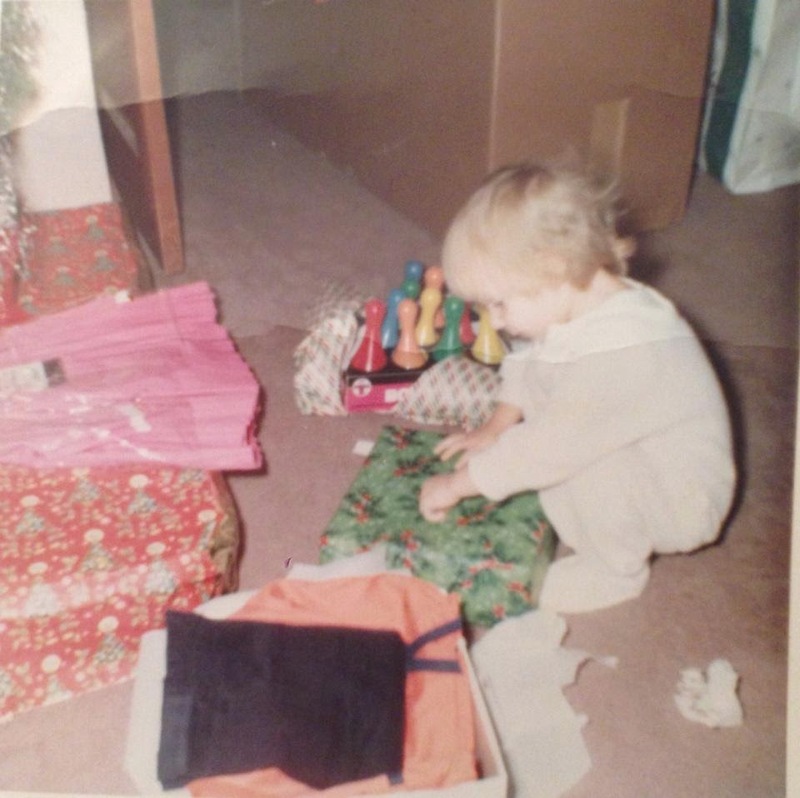 Here is me with one of my favorite Christmas presents as a child (the bowling set, NOT THE DRESS!) in 1967. For those who do not celebrate Christmas, I wish you a great end of 2014. Author Aunt Barb's PapersPosted on December 24, 2014 April 2, 2017 Categories UncategorizedTags UncategorizedLeave a comment on Merry Christmas! This post continues my Edna Henry and family project. I have been working on this for almost a week at an average of about 1-2 hours a day or researching. 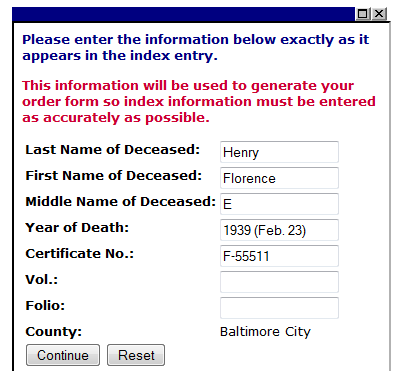 Since I have William and Florence’s death dates from the land records and found both of their death notices in the Baltimore Sun, I want to see if I can locate their death certificate information in the Maryland death indices. I will not be able to obtain the death certificates anytime soon. They are $25.00/certificate when ordered on-line (they are certified). So I like to wait until I have quite a few to get and then I go in person to the Archives in Annapolis, Maryland. The indexes are available on-line at the Vital Records Indexing Project. The index is free to search and does not require any registration. However, if you choose to generate a death certificate order you will need to create a free account. On the main page, click Search MD Vital Records. Clicking the Search link yields the search page. The Baltimore City indexes are separate from the County indexes. For the county indexes, all counties are included within each available date range. I will search Baltimore City first as 3030 Westfield Avenue is in Baltimore City and the closest hospitals to that location would have been in Baltimore City. 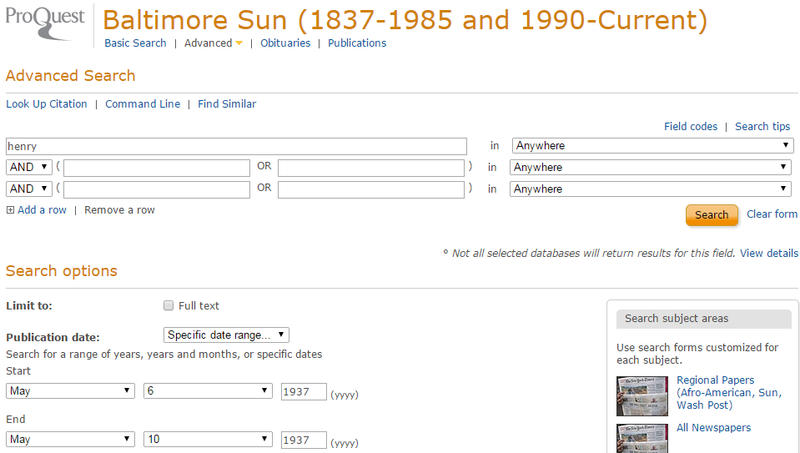 So I will click on the Baltimore City Indexes for 1875-1972. The City indexes for 1875-1880 and 1943-1949 are different as the records are not scanned. You have the ability to type in names and years. For the rest of the indexes there are scanned images of either cards (for the counties), or index pages (for the city). I will select 1937 to search for William. The indexes in this time period are typed pages arranged by first letter of last name, then organized by the first vowel in the name and finally listed in order by month and day of death. Earlier indexes are hand-written and sometimes arranged by first letter of last name and then first letter of first name. Also, the earlier indexes that contain multiple years within a single index are a bit jumbled. Later indexes are organized by soundex. I go to page 5 which covers the “H” “e” for May (William died on 5 MAY 1937). William R. is not listed in that time period. I do notice however that scanning further down the page is a “Henry, William R.” on Jul. 11th. Hmmmm. Could his death certificate somehow have been misfiled? I do a quick search of the Baltimore Sun for July 12-16, 1937 and do in fact find a death notice for William R. Henry that died on July 11th. There is mention of his parents (names that are not familiar) and he to be buried in Ohio. This isn’t my William. So, perhaps he did not die in Baltimore City. Next I search the county indexes. I click on the index for “1934-1944 Han-Hor” and page through the index and realize that the index is mislabeled. It only covers “Han-Har”, the last card in the index is for George W. Harvey. I go back to the main search page and check the indexes for “1934-1944 Gam-Ham” and “1934-1944 Hos-Jones, J.” as maybe those have been mislabeled as well. I find nothing for “He”. Now I will search for Florence. I go back to the city index for 1939. 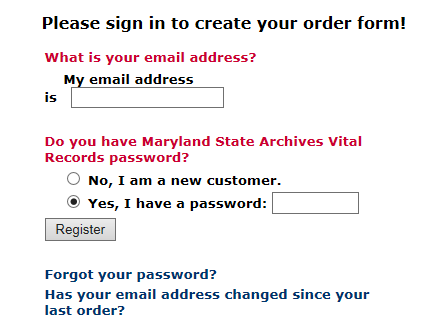 Although I plan on pulling this death certificate myself on my next visit to the Maryland Archives, I still like to generate an order form. I like to print those out and place them in a folder that I labeled “Archives Search” so I have all the information I need when I go. At this point I am prompted to log in or create a new account. Since I have an account I will just log in. Others have ordered certificates from this page based on the window that pops up. I like when a certificate I am interested in shows up here because it means at least one other person out there somewhere is interested in this person as well. I fill out the form. Notice that for the date it only asks for the Year of Death. I like to put the date in parentheses so it prints out on the form. For this date range there are no Volumes and Folios listed in the index so I just leave that blank. When I click Continue the transcription and pricing information is generated. After clicking continue, the screen shows my Shipping and Billing information since I already have an account. No screen shots here!! HA! Next it generates the order form which I can print out. The page can be sent directly to the printer. If your computer has a PDF print driver installed you could also save it as a PDF file. Since it is in HTML format it can be saved, but as a webpage. At this point I have all the information I can get from the death index, but I still do not have any information on William’s death certificate. My guess is that he died in a Maryland county but it is entirely possible he didn’t even die in Maryland. Since his death notice in the Baltimore Sun said he was to be buried at Moreland Memorial Park I will check findagrave.com and billiongraves.com to see if there is an entry for him. Findagrave.com only has one Henry entry (not him) for Moreland Memorial Park and there are none for billiongraves.com. I decide to try to give the cemetery a call to see if they can provide any information over the phone. Some cemeteries will, some won’t. Since I live near the Baltimore area I can certainly visit the cemetery in person. However, it is a large municipal cemetery so walking it to find them will probably not be productive. In what plots in the cemetery are they buried? Do they have maps of the cemetery in the office? Does she know where William died? Does she know what funeral home handled the arrangements? What were their birth dates? Is there anyone else buried in their plot? Can I get a hard copy of the information? I call and the lady that answers is very nice and offers to look him up. So I start down my list. They are buried in Section E-14, Plots 1 and 2. She then says the graves are unmarked. Of course they are, that is my luck. Yes, they have maps in the office. I want a map! William died in Sykesville, Maryland. She also mentioned that Florence died “at home”. Sykesville, could he have been a patient at Springfield State Hospital? L.J. Ruck handled William’s arrangements. I will have to check to see if Ruck has any funeral home records available. At this point she says that she needs to go because the other lines are ringing. I am not upset, I will try to visit in person soon. Most likely, since she gave me some information over the phone, I can get more in person, and hard copies. So, if William died in Sykesville (Carroll County) that would explain why I couldn’t locate him in the death index since the county index was missing for part of the alphabet. I can pull the certificate pretty easily knowing the county and the date but it would still be nice to see it in the index. That is when I remember that the indexes are also located on the Maryland State Archives Guide To Government Records. I go to the guide, go to death records and scroll down to The County Death Records 1898-1972. I find the correct series and find that they have an Electronic version. I click on the MSA SE58 link to bring up the county index lists, scroll to the appropriate date range and click the Link button. This is a huge file so I give it some time to fully load, it took a couple minutes to load the 10,106 pages in the index. I don’t want to scroll through a bunch of pages so I take a guess and jump to page 5000. Hensley, not bad, pretty close. Let’s try 4970. Henry, Walter Eugene. Getting closer. Page 4972 is the winner. Found him. Now I feel better that I did find him in an index. 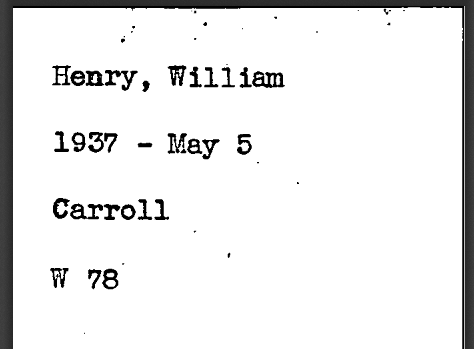 This wasn’t necessary, as I said before I could have pulled his certificate without the index but it does verify that this William Henry died on May 5, 1937 in Carroll County at age 78. My William was born about 1859, that would make him 78 in 1937. I print out the index card and place it in my Archives search folder. When and where exactly was William born? Don’t know. Hopefully when I get his death certificate I will get a clue to that information. When and where did William die? May 5, 1937 in Carroll County, MD (Sykesville). More specific info should be on his death certificate. When and where were William and Florence married? I haven’t even started this search yet! What is Florence’s maiden name? SPARKS. I need to do some searches and see if I can find her before she got married to William. What happened to Edna’s husband (since no one remembers him, only her)? Oh Edna! You are killing me with this one. My mother said she was going to visit Aunt Ruth today, maybe she will remember something to give me a hint. Can I find any new information on William that will lead to new information on his father John Baker Henry, brother Charles Dorsey Henry or grandfather Charles L. Henry? Not yet. I realized in my goals I forgot to add my goals for Florence (where/when she was born and where/when she died. She died Feb. 23, 1939 in Baltimore City, MD (most likely at 3030 Westfield Avenue). Her death certificate should hopefully provide that information and birth information as well. I have much that I still need to do but I am headed in the right direction. This will be my last post on this project. I will try to post an update as I find more but I think that I showed how to use some of the resources for Maryland research. That was my big picture goal. Search strategies will always vary depending on what information you have and what you want to know but hopefully this gave less experienced researchers so pointers. When I first started researching I know I searched the same resources for the same person multiple times because I didn’t keep a log. Many free logs templates are available on the internet. -Make sure to source your records. You should be able to pinpoint exactly where your information came from, even if it was from a conversation with a relative. The internet is a great resource but it is ever changing. Records you find on-line today may be moved, web sites change etc. Don’t assume you will remember where it came from! -Revisit your information every few years..
More and more records are becoming available. Just because you can’t find it now doesn’t mean you will never be able to find it. When I first discovered this family in the early 2000s I could not have found all this from the comfort of my home office. It was all available, just not so easily. All of this on-line research will be followed up by some field trips. I will go to the library to search for more newspaper articles. I will go to the MD State Archives to pull death certificates, birth information for Edna, and marriage information for William and Florence. -Don’t forget about genealogical and historical societies. Although I didn’t use them here, another great resource for Maryland research is the Maryland Historical Society and the various genealogical societies. It may not be financially possible to join all of them but join at least one and try to be as active as possible. You research will improve and you never know who you will meet! -Check your local library to see what services they provide for genealogical research. Public libraries many times offer access to subscription services; Ancestry.com, genealogybank.com, newspapers.com, local newspapers. Also see what microfilmed records they have. Different branches may have different resources. I have a U.S. subscription to ancestry.com but go to the library if I want to search the World records. I can use my own laptop by connecting to their wi-fi network. Message boards and mailing lists are not as popular as they used to be but groups on Facebook, for example, are on the rise. You never know who you will connect with. Continuing my Edna Henry and family research. In Part Four I found potential death dates for William and Florence in the land records for 3030 Westfield Avenue. Now I want to get some other sources for their deaths. Today I am going to see if I can find death notices for William and Florence in the Baltimore Sun. I have a Baltimore County Public Library card so that allows me to access the archives over the internet. The Baltimore Sun is not the only newspaper that would have a death notice but it is the one I can access from home, so it is the first one I check. On my next trip to either the Baltimore County Public Library (I usually go to the Towson Branch) or the Enoch Pratt Library (I usually go to the Central Library) I will search other papers. The Baltimore Sun may have just a death notice whereas other smaller, more local papers may have a larger article. I go to the page and then scroll down to the Magazines & Newspapers area. I log in on the next screen which leads me to the search page. Notice that the database covers several papers. 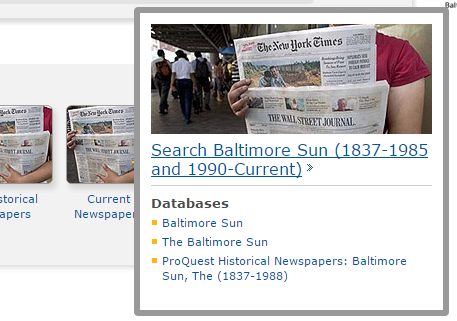 In this case I only want to search the Baltimore Sun (1837-1988 and Sept 1990-Current). If I can’t find anything I will expand the search to all the papers. To limit my search to the one I want I will hover my mouse over the Baltimore Sun (1837-1988 and Sept 1990-Current) and click “Search Baltimore Sun (1837-1988 and Sept 1990-Current)”. This brings up the search for the database I want to use. To find William and Florence’s death notices quickly, I want to limit the search further to specific dates ranges. Let’s start with William. The land records had a death date for William of “on or about May 5, 1937”. Assuming he did die on the 5th, his death notice may appear on the 6th or 7th at the earliest and may be run until the funeral, maybe the 8th to the 10th. I am going to search May 6th through May 10th and if I don’t come across anything I will expand the search. At this point I don’t know where or how William died. There are many factors that could affect his death notice appearance, if there even was a death notice. I am using a date range that is typical for death notices, about a week from the death date. To limit the date range I will use the Advanced search. I fill out my search terms and my date range. I am just searching by the name “Henry”. Many times, because of the format of the death notices, using the last name yields better results than using the full name. This is just my experience. Also, you notice there is an option to search Obituaries. Although I am searching for a death notice, I don’t want to limit to just obits. You never know, there could be another article about him that would not show up in the limited obit search. I get 72 results for the 5 days in my search range. The first one in the list is promising. Notice on the results page you can change the sorting of the results. The default setting is “Relevance”. Usually if I am searching a wider date range I will change it to “Publication date (show oldest first)”. R., beloved husband of Florence E.
The database gives me a choice to print or save the information. I usually like to save it (in PDF format) but I like to save the entire page. I like to have the articles in relationship to the entire page. When I source a newspaper item I like to cite the section (if applicable), page and column and I like to attach the entire page to my source in Legacy. Obviously this isn’t possible for clippings I receive from relative, etc. unless I can go back and find the whole page. If I access newspapers on microfilm where I can’t print out the entire page, I always note the column for my source citation. I click on a few other items in the results list but besides the same death notice on May 8, I find no other articles about William’s death. of the late William R. Henry. While I am here I will do a search for Edna as well. I don’t want to limit the dates this time so I will do a basic search for the phrase “Edna B. Henry”. I get 2 results for real estate transactions for another address, 2901 Bauernwood Avenue. I make note of the address and date and make a to-do item to go back to the land records to search this property. Now I search the phrase “Edna Henry” and get 27 results. Many of these mentions are probably not her as they are from other states for years when she was very young and wouldn’t be “working in Virginia” but some of them have a better probability of being her. I save each possibility for closer inspection later. Attended a birthday party in Nov 1906 for Gladys Elizabeth Cox, the daughter of Mr. and Mrs. Henry Cox in Govans, MD. I am pretty sure the first 3 are my Edna Henry because of the mention of Govans/Govanstown where William and Florence lived during those years. The birthday party and piano recital may seem insignificant but I always make note of the other names mentioned, especially the party. If Edna attended a birthday party it was probably a friend, maybe even a relative I have not yet discovered. An article in the Feb. 20, 1955 edition called “I Remember…A Child’s Govans in 1900” written by Mrs. Edna Henry Wasson. The article mentions her father’s blacksmith shop, although it lists his middle initial as “P”. Letters to the Editor on Apr. 10, 1955 and May 8, 1955 commenting on her article. There is the Wasson name. So maybe she just used her married name when she felt like it? So weird! I also searched “Edna B. Wasson”, “Edna Wasson”, “Benjamin Wasson” and Benjamin H. Wasson” with no results. Searching “Wasson” yielded 956 results. I will plow through those later. On my next trip to the library I will definitely search the other papers on microfilm for more extensive obituaries but for now what did my search yield? May 5, 1937 as William’s death date in the death notice. I now have a second source for his death. Actually it is a 3rd source since I found the date in 2 different land records yesterday. May 5, 1937 was a Wednesday, so his Saturday funeral would have been on May 8, 1937. I now have a second source for Florence’s death date of Feb. 23, 1939. Florence E. Henry’s maiden name is listed as Sparks in both his and her death notices. They are both buried at Moreland Park cemetery. I should check cemetery sites and/or call the cemetery. Edna did use the name Wasson so the SSDI and Florida death index probably is her. Ugh!! 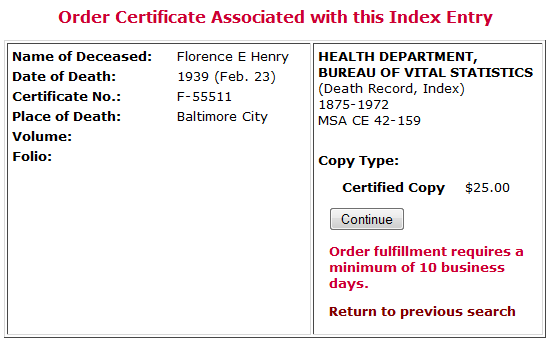 My next step will be to search the Maryland State Archives death indexes for William and Florence. I will post about it next time. The next post will probably be my last one for this project. Continuing my Edna Henry and family project, I am getting ready to start a Land Records search on 3030 Westfield Avenue, the property that William Henry owned in 1930 and his daughter Edna Henry owned in 1940, based on the U.S. Federal census for those years. 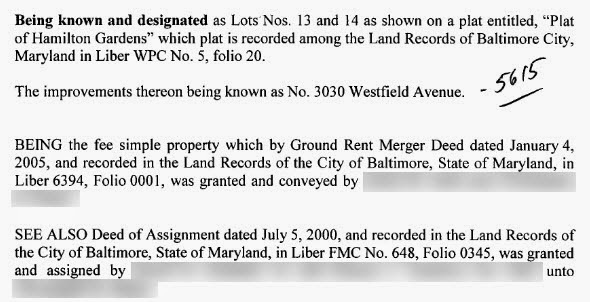 Since the property still exists I am going to go to the Maryland Real Property Data Search site to get the Deed Number so I can (hopefully) trace the property back to the Henrys. Depending on how many times this property has changed hands, I may have to look at several deeds. If you have never used this method of research before it can be frustrating and intimidating at first. Stick with it! Once you have some positive results you will love it. Also, there are other ways to research a property. This is just one way. OK, so off to http://sdat.resiusa.org/RealProperty/Pages/default.aspx. This site is public information and free (yay, I love free!!). In the search area I will search in Baltimore City by Street Address. On the next screen I will plug in the street number and name. I am not going to post entire screen shots of the next part because it will provide information on living persons. Once I hit ‘Next’ the property information appears. The deed reference is 12136/00368. 12136 is the Liber (Book) and 00368 is the Folio (Page). Also, always take note of dates. Many times, plugging in a deed reference will generate several results. This is because deed numbers are reused, but prefaced by the court clerk’s initials. Knowing the date will help grab the correct deed. The date for this deed is 2009. For a little more information on researching land records, this article from the Baltimore Sun may help explain the basics. Armed with that deed reference we can start the real search. The Maryland State Archives provides land records on mdlandrec.net. To access the records you do need to apply for an account, but it is free. At the workshop in May it was mentioned that certain email domains (the only one I remember is AOL) were having issues with the account process. Since I already had an account at that point I really didn’t pay close attention…sorry. Also, I would suggest you look through the HELP! link before getting started. I have used this site for several years so I am fairly familiar with navigating my way around. Once logged in the site looks a little, well…barren. I am going to start by selecting Baltimore City in the upper left. Since I have the deed reference I am going to plug that in the search. Otherwise I would search the indexes by location and year (much more tedious). Again, no full screen shots here, living people. Also note that in this case the deed reference did not present multiple results. There are a few items of interest in this deed. The first paragraph above refers to a plat (drawing of the subdivision). If I want I can go to plats.net (free!) and put in the plat number and get an image of the plat. The next paragraph in this deed refers to Ground Rent. In layman’s terms, ground rent is when one person owns the land and leases it to the person who owns the real property (house) on the land. Baltimore City has a huge amount of properties that have ground rent. You can read more about ground rent here. Although I am not interested in the ground rent information I will follow those references. There may be information that does mot appear in the actual deed. Basically, READ EVERYTHING! The last part refers to the deed. There are different types of deeds, I won’t go into that. But essentially, this is the reference we need to go back further. FMC 648/0345 in 2000. Remember, FMC are the clerk’s initials. Along the yellow menu bar is the option to JUMP TO A NEW VOLUME. This allows me to plug in another deed reference. If I just plug in the Book (648) and Page (0345) numbers I will get 4 results. This is where I need to take note of the date reference of 2000 or the clerk initials of FMC to select the correct record. However, if I plug in the Clerk (FMC), Book (648) and Page (0345) I will be taken directly to the record. I repeat this process back through the paperwork, deeds, ground rent information, mortgages etc. 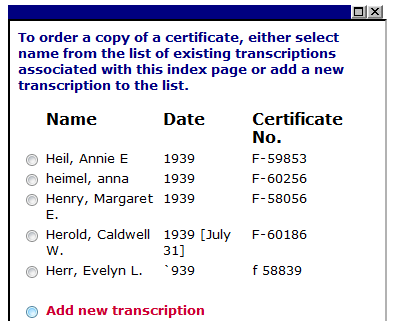 I finally get to a mortgage release for Edna B. Henry on 3 May 1940 (no mention of her parents) that has a reference to a mortgage release on 7 Jun 1939 (MLP 5927/187) for Florence E. Henry widow and Edna B. Henry. So, Florence Henry was a widow on 7 Jun 1939. This doesn’t mean William died on this date, but he was dead by this date. Right below that mortgage release (on the same page) is another entry for mortgage on 7 Jun 1939 in the name of Edna B. Henry. So basically a mortgage from one bank was paid off and another mortgage was obtained. Interesting to note that this mortgage only lists Edna, no mention of Florence although it is the same day as the other mortgage record. The mortgage record continues on the next page. “parcel of ground known as” blah blah blah (deeds are really boring), “recorded in the land records” blah blah blah “Edna B Henry subject to the payment of” blah blah blah…”William R Henry having died on or about May 5 1937 and the said Florence E Henry having died on or about February 23 1939″, blah blah WHAT?!?!?! Back up! Yup, there it is. Searching back further there was another record that listed William’s death date (SCL 5762/564) and I learned that 3030 Westfield Avenue was purchased by the Henrys on 7 Dec 1920 by William, Florence and Edna. As I searched the land records I downloaded PDF copies and filed them to be transcribed and entered into my database. Normally I would do this as I search but because I wanted to created these posts “live” I couldn’t transcribe at the same time. Oh, one other cool thing about the land records, source information is automatically printed on the left side of the pages in RED. Sometimes it is a little hard to read depending on the page image but it is there. I’ve looked at a lot of records but it did not take much time since I had reference numbers. So, what questions have the land records answered? What is up with Edna’s husband (or a lack of a husband)? If she got married in 1936 why is she still using the name “Henry”. If it were 2014 I would not be at all surprised at a woman keeping her maiden name, but in the 1930s (and at least until the 1940 census in April)? Maybe the Edna B. Henry I found in the Howard County marriage index wasn’t her, so the SSDI and Florida Death index entries aren’t for her either? When did the house at 3030 Westfield Avenue get sold? I never came across a land record for Edna selling 3030 Westfield Avenue. I need to follow up on that, I may have missed something. So now that I have potential death dates for William and Florence (I don’t want to rely on just information in the land records), searches of the Baltimore Sun and the Maryland State Archives death indexes are in order. Let me say that I was a bit surprised when I found death dates for both Florence and William! Remember that I chose this method of searching because the property appeared to stay in the family after William and Edna disappeared from the household (1940 census) AND the property still exists. I thought there was a possibility I could get some good information and (for once) my hunch proved correct. I said before how I love free. I also I love LUCK! OK, the dogs won’t walk themselves and it is football day. So although it is so hard to stop, especially after finding some new information, those searches will have to wait. This continues my Edna Henry and family project from Part Two where I summarized the records I collected from 2005-2008. Now I will concentrate on evaluating what I have which should help to decide where to go next. When and where exactly was William born? When and where did William die? When and where were William and Florence married? What is Florence’s maiden name? What happened to Edna’s husband (since no one remembers him, only her)? Can I find any new information on William that will lead to new information on his father John Baker Henry, brother Charles Dorsey Henry or grandfather Charles L. Henry? I realize I may not be able to answer all these questions during this small project but these are the things I am looking for. Did you ever meet Mom-Mom Pisani’s cousin Edna, she died in 1979 in Florida? I don’t remember ever meeting her. I do remember that Pop-Pop (Angelo Pisani, Ruth A. Henry’s husband) used to make comments about her. Apparently her and Mom-Mom (Ruth A Henry) used to go to Annapolis when they were younger before Pop-Pop and Mom-Mom were married. Pop-Pop would tease her about them going to meet sailors. And I think Edna traveled a lot and would make comments to Pop-Pop about how he should let Mom-Mom go with her. And I think she worked as a nurse or something for elderly people. I don’t know where she did this exactly, whether she lived at their houses or what but I am pretty sure I heard something about that. That is all I know. Have you ever heard the name Benjamin Wasson, she married him in 1936? No. To be honest I don’t remember anything about a husband. I think she was always referred to as Edna Henry. Do you remember anything about Edna’s parents? Nope. I knew that she was Mom-Mom’s cousin, and a Henry but I was never quite sure how exactly she was related. Next time you visit Aunt Ruth can you ask her these questions? I will but I’m not sure what answers I will get. Hopefully I will have more on that once Mom goes to visit Aunt Ruth. Plugging in William R Henry, birth year of 1859 in Maryland yielded 147 results for the 1940 census. The best candidate was the first on the list. Why is Cambridge, Dorchester County, Maryland a possibility when all earlier records were in Baltimore County and City? 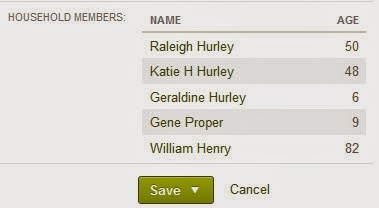 My 2nd great grandfather (and William’s brother) Charles D. Henry had 3 daughters. Two of them married men from the Eastern Shore of Maryland. Charles D. and his wife Charlotte lived there for a time as well. There are many pictures that Aunt Ruth has that are from family outings on the Eastern Shore. So there is a connection to the Eastern Shore so I wouldn’t just eliminate the possibility. The father-in-law relationship would hint that if this is the right William might be the household of Edna’s husband. I have a record that Edna married Benjamin H. Wasson in 1936. Beyond his name I know nothing about Benjamin. Maybe he is from the Eastern shore? Or a sailor? Unless Edna changed her name, married someone else, gained 3ish years in age, or William and Florence had another daughter that never showed up before, this isn’t my guy. I go back to the search list but no other matches fit seem to fit. I checked some of them out anyway. Nothing. OK, so maybe William has passed away between 1930 and 1940. Let’s look for Florence. None of the 5 Florence Henry results matched at all and there were none in Maryland. I clicked on a couple just to make sure but again, nothing. Maybe both William and Florence died between 1930 and 1940. Hmmm…I am not going to throw this away, but I don’t think this is who I am looking for. So far, Edna has never been enumerated as anything other than Edna or Edna B. We will file this as something to explore further later on. OK, I think I found her. Edna B. Henry in the 27th Ward of Baltimore City at 3030 Westfield Avenue. This is the same address from the 1930 census when she was living with her parents. Edna is listed as the single 45 year old head of household who owns the house and is employed in candy sales, making and selling candy. There are 3 others in the household that I may need to revisit later. What is important about this record (and why)? I continue to do some additional searches for William and Florence but still come up empty. Now I decide that I am going to concentrate on trying to find out if William and Florence did in fact die between 1930 and 1940. There are several directions I could go here and there may be readers who would choose a different path. We will see where my path leads me. I could search the Baltimore City Directories to see if I could narrow down when they no longer appear in the directory. Since I have a U.S. subscription to ancestry.com and a subscription to fold3.com I can view many of the directories from the comfort of my home office. But there are gaps in the directories between 1930 and 1940 and that method is not always reliable. I could luck out but I’m going to search other resources first. I could search the Baltimore Sun archives. Since I have a Baltimore County Public Library card I can access the archives from home as well. However, searching can be a bit tedious, especially when searching the name “Henry”, even for a relatively small 10 year range. I could search the Maryland State Archives death indexes. This is a great resource but at this point I will have to wade my way through each of the 10 years from 1930 to 1940 (for Baltimore City) and possibly the County indices as well. Back in May I attended a Workshop hosted by the Maryland Genealogical Society on Maryland Land Records. The workshop was excellent and what I learned has helped my research immensely. Since William owned the property in 1930 and Edna owned it in 1940, maybe she inherited the house somewhere in those 10 years (if they are in fact dead in 1940). 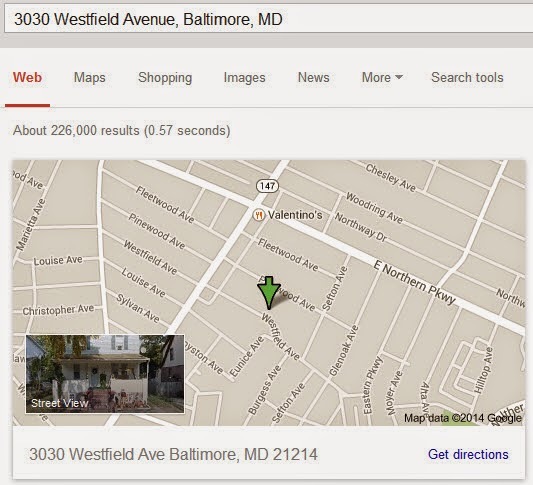 I googled 3030 Westfield Avenue and it still exists, making it easier to track the property back through the records. If the property no longer existed I could still search this way but I would have to start searching through the Grantor or Grantee indexes until I happened upon them. Land Records can provide some unique information. Besides property information you may find death dates, filed will information, and relationship information. I have found this helpful to find maiden names or for the reverse finding names of men daughters married. Sometimes however, it is just boring (but useful) property information. There is even a street view, what a cute little house. Since real life calls, I will start my Land Record search…tomorrow I hope. In my last post I introduced my Edna Henry (and parents) project. This post will cover what I know about Edna, William and Florence Henry before I start any new research. When I first started genealogy research in 2003, my main concentration was my direct line, so Charles D. Henry, his father, etc. Anything I found on non-direct people were entered into my database but not sourced (bad, bad, bad). In 2003 the majority of the on-line resources I used were from ancestry.com and genealogy.com (which has been discontinued and now consists of just read-only message boards and user created family home pages). As I go back now to review what I already have, I am also taking the opportunity to source the records as well. As is common, my research started with conversations with relatives and exploring any resources they had in the home. Along the Henry line, my mother and her sisters, Aunt Ruth and a couple of her Henry cousins were the only ones surviving. There were several pictures of Charles D. and his wife. My Aunt Ruth had some names written down; Charles’ father’s name (John B) and information on Charles D. and Charlotte’s children, but nothing on any siblings of Charles. No one had any family bibles that had any information that went any further back than John B. Henry. The cousins I talked to were children of Charles D. and Charlotte’s children and no one mentioned any siblings of Charles, but to be fair, I did not ask. At this point I had not yet heard any mention of cousin Edna. Once I figured I had exhausted those resources it was on to search the U.S. Federal Census records. At the time the latest census released was 1930, and it was not yet indexed. In fact, not all census records before 1930 were indexed either. If you are a “new” researcher you may remember the extreme frustration of waiting all of a couple months for the 1940 census to be indexed? Imagine that for many of the census years, and the wait was way longer. So basically, census research was a bit more tedious. I don’t remember the time it took to locate the census records from 1930 back but it was much longer than what it would take now. Also, there may be a few reading this who are mumbling “well, they may not have been indexed but at least they were on-line”. Yes, I bow to you! As I worked my way backwards from 1930 in my search for Charles D. Henry , William first appeared in the 1880 U.S. Federal census in Waverly, Baltimore County, Maryland. He is listed as the 21 year old son of John B Henry, single, born in Maryland and employed as a blacksmith. In the 1870 census in the 8th District (Ellen Gowan Post Office) of Baltimore County, Maryland William is listed as an 11 year old born in Maryland, living in the household of John B. Henry. Note: You may notice the presence of a sister of William and Charles named Ruth in the census record above. She will not be included in this project as I have previously been successful in finding information on her. In the 1860 census in the 8th District (Cockeysville Post Office) of Baltimore County, Maryland William is listed as a 1 year old born in Maryland, living in the household of Charles Henry. Note: You may notice the difference in names of the oldest female in the house in the census record above. John B. Henry’s wife Mary (Whitaker) died in 1861 and John married Mary’s sister Martha (Whitaker) in 1866. OK, now that I have found him back to his earliest census, let’s go forward from 1880. Back in 2003 I did make the assumption that he remained in Maryland. In April 2004 I found William and family in the 1900 census. William is listed in the 9th District, 1st Precinct of Baltimore County, Maryland. He is 41 (born Feb 1859), married 10 years to Florence (also 41 and born Feb 1859) with 5 year old daughter Edna (born Aug 1894). He rents his house and is a carriage builder. It is unclear from the census record what street he lives on since his entry is on the top of a page that doesn’t appear to be a continuation of the previous page. Apparently January 2005 was a busy month and I continued research on William and family. The next 3 census records were entered for them in Jan 2005. In the 1910 census William and family is found split between 2 sheets in the 9th District, 1st Precinct of Baltimore County, Maryland on York Road (no house number listed). William is 51, married 19 years to Florence (also 51) with 15 year old daughter Edna who attended school within the year. He owns his house and is a blacksmith. In the 1920 census William and family is found in 9th District of Baltimore County, Maryland on Old Harford Road (no house number listed). William is 60, married to Florence (also 60) with 25 year old single daughter Edna. He rents the house and is a painter at a car company. Edna is employed as a bookkeeper at a drug company. In the 1930 census William and family is found in 27th Ward, Block 118 of Baltimore City, Maryland on 3030 Westfield Avenue. William is 71, married to Florence (also 71) since they were both 31 years old with 35 year old single daughter Edna. He owns the house and is a painter working for himself. Edna is employed as a bookkeeper at a bank. In February 2005 I entered listings for William from the Baltimore City Directory for 1885 and for 1912. I did not include any detail for these. Chances are I found this while searching for his brother Charles D.
This concludes all the records I have on William and Florence. I have a few additional records on their daughter Edna. From the Howard County Marriage Licenses she married Benjamin H Wasson on 4 April 1936. As far as the source for the marriage, that is all I recorded. I remember I got this from a website. Many of my relatives, although residents of Baltimore County or City got married in Howard County so I referred to the site often but never properly sourced it. From the Social Security Death Index at ancestry.com she was born 11 Aug 1894 and died Jul 1979. Her last residence was In Miami, Dade County, Florida. From the Florida Death Index, 1877-1998 at ancestry.com she died on 28 Jul 1979 in Dade County, Florida. This is all the information I have in my database for this family.